Yarrow is a medicinal herb that reaches up to 80cm. It has green stalks and white flowers on the top. It can be found in a variety of meadows and pastures. It is a source of energy, that is how the ancient Greeks thought, and therefore they gave it the name Achilea millefolium, according to the mythical Greek hero Achilles. This herb grows and is harvested during the summer. It contains many different substances, minerals and vitamins. Various recipes can be prepared from yarrow, but the most famous is yarrow tea. Aficionados of folk medicine, attribute a lot of effectiveness to the yarrow, especially on the digestive system. It is effective against stomach problems, problems with digestion, flatulence, vomiting and so on. Also it is excellent for detoxification of the body, regulating of the hormones and stabilizing the metabolism. Like chamomile, it is ideal for coatings and rinsing, to quell infections and other inflammatory processes. It is excellent for cleansing the liver in conditions of poisoning, viral hepatitis and other diseases that attack the liver. Except for the liver, it is good for the pancreas, immune system, stomach, heart, kidneys and other vital organs. The tea prepared from this herb is excellent for nursing mothers, for people who suffer from psoriasis, against cracked arms and all other related conditions. This herb is excellent for soothing the nerve system, it is recommended to make baths with it that are really excellent, has calming effect, to relax the body and make you feel clear and in good mood. Experts in alternative medicine recommend this herb for women who have heavy and painful menstrual cycle. Yarrow may be a great diaphoretic – A diaphoretic food increases perspiration. Yarrow oil has shown to increase perspiration and help remove toxins, excess salt, and water from the body. Extra sweat also cools the body down and gives relief from fevers. Yarrow may assist in digestion – It helps the secretion of enzymes and digestive juice and increases appetite; both qualities aid in digestion. Yarrow can be antiseptic – It has been used in the market for its antiseptic properties. The plant heals wounds and activates blood platelets to promote healing. The oil also has bactericidal and antifungal properties, which prevents infection. Yarrow may help with muscle spasms – A muscle spasm is an involuntary skeletal muscle contraction. Muscle spasms in the respiratory system can cause severe coughs. Yarrow oil can help individuals by having a relaxing, antispasmodic effect on muscles, nerves, intestines and respiratory tracts. Yarrow may be anti-inflammatory – The essential oil of the plant has anti-inflammatory properties that help the nasal or respiratory tracts resulting from the common cold, the digestive system caused by overeating of spicy food, or the circulatory system caused by any toxin getting into the bloodstream. 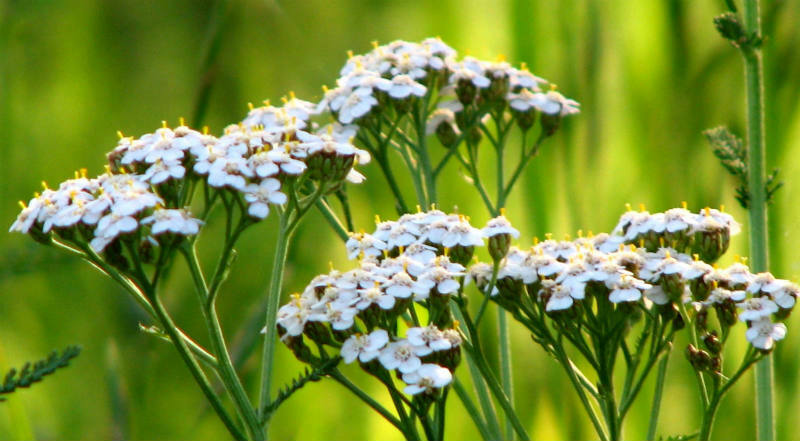 Yarrow may help you stay looking young – Keeps the skin free from dryness, cracks, and unsightly marks. This keeps the skin stay looking smooth and young. Yarrow may help tone the body – It helps optimize metabolic functions like decomposition of food and the absorption of nutrients by toning up the liver, stomach and intestines and helps individuals grow stronger and healthier. The plant assists in proper excretion, regulates the endocrine secretions of hormones and enzymes, and boosts the immune system. According to what we wrote in the article above you can realize that this herb is friendly to our body, has an excellent range of effects on many conditions so it is time to pay more attention to its frequent use.